From the Big 10 Conference, Wisconsin remains number one in my weekly poll for the fourth week in a row. Looking below Wisconsin in my college football poll, it seems there is constant movement of musical chairs being played as the college football season winds down in the home stretch. The upsets and unexpected outcomes of college football keeps happening. What many media members fail to understand is towards the end of the college football season, normalcy does not exist, but the unexpected seems to rear its ugly head. This causes a shake up with everyones polls, rankings, confidence levels, cognitive thoughts and the facing of the reality of how college football changes on a week to week basis. These types of changes are great for the sport of college football and those fans who enjoy the games, in addition to the possibility of expanding the playoffs. With three (3) weeks remaining in the college football season, their are only four (4) 0-loss programs remaining. Of those 0-loss programs, Central Florida from the American Athletic Conference (AAC) is not receiving the credit or just due ranking either in the coaches poll or CFP polls, for their successful season in which they have earned, not given. I am the only one who ranks Central Florida in the Top Five (5). Central Florida ranks first in Offensive Efficiency with my rating system in which I designed and created. Central Florida’s Offensive Efficiency Rating (OER) is at (.580). This means Central Florida’s scoring efficiency is based upon number of total game possessions both offensively and defensively, and turning those possession into points, at 58% of the time. Moreover, Central Florida ranks in the Top Half of all FBS programs in cumulative records within their non-conference scheduled opponents at a rate of (.536). I guess the CFP committee does not use all data points to give credit in ranking, where credit is due. Key: A-Rank Order; B- Team and Current Overall Record; C- Percentage Rate of ranked teams Opponents Cumulative Record from their Non-Conference Schedule and Rank within that Categorical Variable; D- Percentage Rate of ranked teams Opponents Cumulative Record from their Overall Regular Season Schedule and Rank within that Categorical Variable; E- Percentage Rate of the ranked teams Opponents Cumulative Record from their Conference Schedule and Rank; and F- Percentage Rate of ranked teams Offensive Efficiency and Rank within that Categorical Variable. As of this time of the current college football season there are 59 bowl eligible FBS programs with six (6) wins or more, and 21 more waiting in the wings with five (5) wins. There are three (3) weeks remaining in the season; there are plenty of opportunities for the 21 four (4) win FBS programs to earn bowl eligibility. Time is running out on some. Who will earn those bowl bids? How many FBS programs will become bowl eligible? We will find out soon. If you plan in reciting any of my ideas, thoughts or rankings to disucss publically in print, web based media postings or on air debates either in television or radio; please adhere to the APA/MLA polocies and procedures when citing sources. Even thought the primary ranking groups of the; CFP Committee, the Amway Coaches Poll, and the AP Media Poll weekly college football rankings, do not have Wisconsin ranked as Number 1, I do. It was said, on an ESPN late night radio show from the Freddie and Fitz show, and I will be paraphasing from Ian Fitzimmons based out of the ESPN-Dallas area and when a caller from Arizona commented about the College Football Playoff ranking of the Top 4. The callers question was “why not just rank the 0-loss programs as the top four seeds because they are un-defeated”. Ian Fitzsimmons commented to the caller ” we are not handing out participation trophies here, its about selecting the best four football programs” (Fitzsimmons, 2017). Interesting that Wisconsin football team is a 0-loss program and on the outside looking in for the College Football Playoff. I have them ranked number one in my polls th the last few weeks over the popular 0-loss programs of Georgia and Alabama. What the sports media “experts” and the CFP Committee, fail to understand is that numbers and data do not lie. The sports media can manipulate the image in what we see and do their best to forget about the numbers and data. I am purely opposite, I use the professional model theory to support my rankings and other variables to account for why and how I rank one (1) through twenty-five (25). Ranking programs is more than just an eye test, and media promotion of what they believe is the best college football programs. Games are played by the players, coaches coach the game, each make cognitive decisions to make the best play and each effort by both coaches and players is only measured by play outcomes both good or bad. The ranking numbers by the media possesses vested interest, where as I rank based upon specific data points, not vested interest. Ranked positions are earned not given. The rankings should not be based upon who you are, which conference you represent or who the sports media supports. There are so many more great games to be played during the remaining 3+ weeks of the college football season. With many more upsets to occur and more great finishes to watch as the top teams go head to head to create more controversy of who will make the publicized playoffs. I believe we are at the “top of turn four” of the college football season. Its going to be an exciting, remaining, last few weeks as many will root for the upsets and more great games. Here are my weekly rankings for college football. Honorable Mentioned: Mississippi State, Auburn and Virginia Tech all are (7-2). Key: A-Rank Order; B- Team and Current Overall Record; C- Percentage Rate of ranked teams Opponents Cumulative Record from their Non-Conference Schedule and Rank within that Categorical Variable; D- Percentage Rate of ranked teams Opponents Cumulative Record from their Overall Regular Season Schedule and Rank within that Categorical Variable; E- Percentage Rate of the ranked teams Opponents Cumulative Record from their Conference Schedule and Rank. As of this time of the current college football season there are 50 bowl eligible FBS programs wth six (6) wins or more, and 21 more waiting in the wings with five (5) wins. At the four (4) win level and only 3 or 4 opportunities to become bowl eligible. There are three (3) + weeks remaining in the season; It’s going to be exciting, fun and heart breaking. Coleman, Freddie and Ian Fitzsimmons (2017). ESPN Radio. Evening Time Slot. “Discussing the current college football playoff rankings, taking listener calls and questions.”. Talk Radio. ESPN-Bristol and ESPN- Dallas. ESPN Studios. Wisconsin (8-0) takes over the number one ranked spot within my weekly college football rankings. The reason why Wisconsin (8-0) is ranked number one and not Georgia or Alabama ranked number one is due to the fact that Wisconsin and the BIG 10 have made SIGNIFICANT strides to eliminating scheduling the FCS games and scheduling more road games at FBS site venues. Fact; The BIG 10 only scheduled three (3) FCS games this year but, the Southeastern Conference scheduled every SEC program with an FCS game. The most interesing fact is that Alabama is scheduled to play FCS Mercer the week before Alabama plays Auburn on Thanksgiving Weekend. This fact, not theory, decreases the SEC credibility within their non conference schedule as a whole. Published research states that FBS programs who schedule FCS programs, win 90% of the time, and by at least 4+ possessions. That 4+ possessions means by at least 28 points. This inidcate that easy wins versus lower level classification outside of the FBS level earns no credibility even if you are a 0-loss program. The other factor that gives Wisconsin the number one ranked position within my poll is they played or will play a non-conference game on the road at an FBS opponents stadium site. Thus playing games on the road within your non-conference schedule means you are taking a RISK playing in an un-comfortable setting. Alabama is playing no FBS programs on the road at THEIR stadium site.To tie all of this together, Wisconsin scheduled 12 FBS programs and the SEC only schedules 11 FBS programs. FACTS are FACTS to the reality of the situation, you cannot change the evidence of the findings and data. What a great college football season this has been turning out to be. Upsets, surprises and more as we continue through “Amen’s Corner” of the college football season. Hats off to Iowa State for pulling the third consecutive win over a marquee named opponent and increasing the record of Iowa State to (6-2) overall and (4-1) within the Big 12 Conference. Iowa State is tied atop the conference with Oklahoma, Oklahoma State and TCU. Iowa State is bowl eligible with this win and success can only continue for this Cyclone program. With four (4) weeks remaining, there are still more upsets and surprises in store. Ohio State (7-1) pulls off the comback victory over Penn State (7-1), to redeem last years loss and to decrease the number of 0-loss programs remaining within the FBS level of play. Heading into this week’s college football schedule there now stands only five (5) 0-loss programs; Wisconsin, Georgia, Alabama, Miami (Fla.) and Central Florida. I wonder who will be the next 0-loss program to fall? With four (4) week’s remaining of the college football season, my intuition tells me that there will be only two (2) 0-loss programs left standing at the end of the regular season. Not sure which two (2). I am not like the sports media “experts” from ESPN or FOX Sports that use a crystal ball to predict outcomes of the college football season, predicts final season records and predicts who will win each week. I let the games play out and analyze the data to determine how to rank. This weeks college football schedule has MANY interesting marquee games that will effect the rankings. First game of importance is (7-1) Oklahoma and (7-1) Oklahoma State. This will cause seperation within the Big 12 and move a 1-loss team to the 2-loss team group. Other Games of interest are: (8-0) Georgia playing (6-2) South Carolina, (8-0) Alabama playing (6-2) LSU, (7-0) Miami (Fla.) playing (7-1) Virginia Tech, (7-1) Notre Dame playing (5-3) Wake Forest, (7-1) Penn State playing (6-2) Michigan State, (7-1) Toledo playing (6-2) Northern Illinois and on a short week on Thursday Night, (7-1) Clemson playing (6-2) North Carolina State, (7-2) USC playing (6-2) Arizona, (7-2) Washington State playing (6-2) Stanford, (6-2, and Marshall playing (5-3) Florida Atlanitc. Wonder which game ESPN College Game Day will attend. This one is obvious, ESPN CGD will set set up shop for the Alabama/LSU match up. Honorable Mentioned: All are (6-2): Army, Northern Illinois, Ohio, Troy, SMU, North Carolina State, Iowa State, Arizona, Auburn, Kentucky, Mississippi State, South Carolina, and LSU. As of this time of the current college football season there are 39 bowl eligible FBS programs wth six (6) wins or more, and 25 more waiting in the wings with five (5) wins. There are four (4) weeks remaining in the season; there are plenty of opportunities for the 19 four (4) win FBS programs to earn bowl eligibility. With the ever changing suprises and close calls in college football this season, the rankings will continually change week to week. Alabama (8-0) takes over the number one ranked position this week in my weekly polls. Alabama (8-0) is on a bye week this coming week and could possibly lose their number one ranking in my next poll if any of the grouping of (7-0) FBS programs; Wisconsin, Penn State, Georgia, TCU and South Florida win this coming weekend. College football is starting on the back half of the season and we could call this “Amen’s Corner” time in college football. The “Amen’s Corner” of the college football season starts with each game, each possession, the outcomes of other games and hoping for other highly ranked FBS football programs to stumble. If you are one of the eight (8) remaining 0-loss programs, your objective is to remain on course, do not look to far ahead, and maintain attentional focus at the highest level of competition and performance. There are still many games yet to be played, some surprising upsest still on the table to be served and some un-expected FBS programs earning better win-loss records that even the “experts” did not foresee happening. I guess the crystal ball that they are using must be broken. As of this moment, there are 28 Bowl Eligible FBS Programs and 21 waiting in the wings FBS programs currently with 5-wins heading into this week who can earn bowl eligibility. If we examine the bottom of the rankings, there are 3 FBS programs still searching for their first win; Baylor, Georgia Southern and Texas El Paso. Who will get their first win and avoid going (0-12). If you plan in using any of my ideas, thoughts or ranking to disucss publically in print, web based media postings or on air debates either in television or radio; please adhere to the APA/MLA polocies and procedures when citing cources. Georgia (7-0) is the newly ranked number one FBS team in my third weekly college football ranking poll. At this point in time of the college football season, Georgia is statistically better than any other (7-0) FBS teams in multiple categories, in which I use to assist in ranking weekly. However, as the season winds down and progresses forward, anything can happen with many great remaining scheduled games left to be played in many conferences. Within my rankings, there are still many of the ranked FBS programs that have not had a bye week yet. With at least six weeks to go in the college football season, ANYTHING can happen. With the season just past the half way point, there are eight (8) 0-loss programs left and of those eight remaining programs, only two will compete against each other in the regular season. Those two programs are Central Florida and South Florida. Both will meet at the end of the regualr season in the American Athletic Conference. The other remaining 0-loss programs wont possibly meet until the conference championship games and that’s if they remain at 0-losses. In addition to those 0-loss programs, there are still 18, 1-loss programs. There is plenty of college football left in the remaining part of the schedule in the upcoming weeks. NO ONE really knows how the season will play out, not even the “experts” of college football. Trust me there are still many great games left on the schedule and UPSETS are going to occur. Just let the season play out before you start making guesses into who will be in the playoff picture. The one primary problem with the sports media “experts” from ESPN and FOX is that every week before and after college football games are played, they believe they are entitled to select which four (4) FBS teams will compete for the CFP. The funny thing is they change their minds weekly and sometimes daily just trying to be right. I say at this point of the season, pick four and stick with it. Your job is not to play “Carnac The Wonderful” and always guess what will happen. Maybe guessing wrong should effect their employment status when they find it difficut in selecting between vanilla or choclate ice cream. For this weeks rankings, I am only going to post the Top 25 in rank order, with team names and overall records. I will return to posting the important statistical data next week. I have the updated data. However, it’s interesting that between the AP voters and the Coaches Poll that they never match or use the same data I do. I have no vested interests in who is ranked where, just need to rank each FBS program with a fair ranking. All of which takes knowing what data points to use in evaluations. Honorable Mentioned: Virginia Tech (5-1), Stanford (5-2), Army (5-2), Ohio (5-2), Colorado State (5-2), Auburn (5-2), LSU (5-2), South Carolina (5-2) and Texas A&M (5-2). There are many SEC programs at (5-2), but its the programs from one specific division within the conference. This will change as the weeks play out. Please do not forget to use the APA/MLA method if you use any of this copyrighted material. Always give credit when credit is due. Coach MIke Leach, the Washington State Head Football Coach, went on an extended highly cognitive discussion during his weekly press conference about how an expanded playoff format can be implemented at the FBS level of play. One of Coach Leach’s first comments during his press conference states that “I think 64 teams for a playoff, but minimum 16 teams for a playoff in college football” (Leach 2017). Coach Leach believes that 16 teams could “settle alot of these issues” (Leach, 2017). This is what I have been saying since (2007) when I started my Master’s degree with the investigating of the un-ethical manner, in which college football settles and determines their “National Champion” both in the BCS system and CFP system. I concur and support what Coach Leach expressed in support of major changes within a Democritus playoff system that not only selects 3% of FBS programs to compete for the “National Championship”, but also only selects those “elitists” programs that are classified from the Power Five Conferences and Notre Dame; to compete for the $50 Million dollars at stake, the crystal trophy, in addition to the prestige and notoriety that comes along with being called “National Champions” of college football. It’s interesting that educationally sound published research since (2013) and again in (2016) within a literary work, already investigated this subject matter. However, I give credit to Coach Leach for possessing a higher cognitive thought process and critical thinking skills, like myself, to openingly discuss and bring this highly sensative subject matter to the forefront. In turn, what Coach Leach spoke of during his press conference not only VALIDATES my research, but offers support that change needs to be made in the direction of a more Utilitarianistic way in addressing the college football playoff subect matter, by implementing the Stuart Mills philosophy. 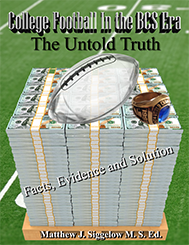 Within my most recent publishing of research titled; “College Football In The BCS Era The UntoldTruth Facts Evidence and Solutions” clearly outlines and explains how a 16-team playoff format at the FBS level of play could be implemented. In addition to the implementation of the playoff format, I also developed a fair assessment system to assist in the selection and seeding process to determine which 16 FBS programs earned the right to compete for the for the “National Championship” based upon specific categorical variables to assist in rank order and seed selection. Thus, eliminating the need for a committee who would possess bias or vested interest in seeding the field of 16. Even Coach Leach states it best, “If the levels below us; such as states within the United States of America where high school football is followed by many, i.e. Texas, California, Florida; NCAA Division 3, NCAA Division 2, NCAA Division 1-AA (also known as FCS) and the higher level above us, the National Football Leauge can possess an expanded playoff, then why can’t we (meaning the FBS level of play)” (Leach, 2017). However, convincing the power brokers of college football at the FBS level of play, known as Dr. Mark Emmert; President of the NCAA, the NCAA Competition Committee, Bowl Committees, Mr. Bill Hancock, Mr. MIke Slive, the current CFP Committee Chair Mr. Kirby Hocutt; Director of Athletics at Texas Tech, all Conference Commissioners from all FBS College Football Conferences, all the college and university Presidents, Athletic Directors and Head Football Coaches from the AFCA; need to attend a presentation specifically in this subject matter. If a well respected head football coach at the highest level of college football can cognitively see the expanded playoff process, then why cant the power brokers? I believe that since I performed and published all the research to address this topic of expanding the college football playoff to 16 FBS teams, then I should be the one who performs the presentation to the names and groups mentioned in the above paragraph. For those who do not know, It took me 10+ years to develop and investigate the implementation of this 16-team playoff format and other topics which directly correlate to college football at the FBS level with the expanded playoff format. I read 30+ published peer reviewed journal articles, from doctoral professors, Ph. D. students and those with a Master level of education. Each peer reviewed article were chosen to directly possess subject matter associated to specific categotical variables, within the dependent variables which possesses a direcct relationship to the independent variable. In addition to reading peer reviewed journal articles, I also read 15+ published literary works (books) associated with athletic administration, sports management, college football related subject matter and books written about other playoff concepts. All of these books were written by Doctoral professors of Sports Management and Athletic Administration, and or written by sports writers who investigated the BCS and other playoff ideas. I combined all that written, published, copyrighted material and added the collection of 25,000+ numerical data points to support and address any questions in the development of my 16 team playoff format. However, the review of data and reading did not stop there, I performed other research to assist in anaylzing other variables that possessed a direct effect on the Democritusly driven BCS system and still Democritusly driven CFP system. In closing, If well known college football coaches who have spoken about the need for change at the FBS level of college football in how they determine their “National Champion” and the need for a standardized, universal, cross conference, cross divisional scheduling format, with the elimination of scheduling FCS programs; then that within itself VALIDATES and supports the research I performed, published and copyrighted in my literary work (book). Again, Thank You Coach Mike Leach for disucssing the expanded playoff format subject with your local media. NOTE: if you decide to use any of this written, published and copyrighted material, please be cognizant of using the APA/MLA citation methods, citing your source. MIke Leach Goes Off: Expand The College Football Playoff. Press Conference with Washington State Head Football Coach; Mike Leach. Vidoe posted on Youtube.com. Posted by CBS Affiliate KREM2 in Washington on October 10, 2017. https://www.youtube.com/watch?v=y_nuMEtwUW4. M. S. Ed. Athletic Administration, Sports Management, Kinesiology and Sports Studies from the State of New York at The College at Brockport. For the second week in a row, Penn State remains number one (1) in my weekly college football poll. Penn State has proven itself thus far, at this point of the season to retain their number one (1) ranking within my poll. Penn State are scheduled on a bye week for this weeek and their number one (1) will be in jeopardy if any of the (6-0) ranked teams wins the seventh (7th) game. This does not mean that Penn State cannot re-capture their number one (1) status once all the bye weeks have been played out. Please remmeber I rank based upon the use of the professional model theory in which I rank CFB programs 1 through 25, thought out the course of the season. As the college football season is just about reaching the half way point, there remains many questions that cannot receive answers until the end of the college football regualr season. However, the sports media who are the “experts”, claim they possess the answers to all things that are going to happen within college football. For example, how many so called sports media “experts” used their crystal ball to predict Iowa State to beat Oklahoma this past weekend? Or, how many sports media “experts” predicted that Michigan State would beat Michigan in Ann Arbor? My guess, probably not one of them. It should behoove these sports media “experts” to stop predicting and just analyze once the game is complete. This week’s rankings will be no different than last weeks based upon what variables I used. However, I have removed two categories and added two new categories. Within my rankings, I have provided statistical analysis in percentage rates, (i.e. numerical data), and then attached a rank order number within that specific categorical variable to assist in evaluation and comprehension for any debate like questions. As the college football season moves forward, there will be considerably less number of same data numbers in percentage rates to avoid the comments of, same percentage rate but different ranking positions. Before I post my college football Top 25 from this past weekends results, I am curious how the “experienced” and “expert-like” CFP committee will handle end of the season situations such as this: Miami (Fla.) ends the season (11-0), because they lost one game due to an act of God at the beginning of the season? There is nothing published with the selection protocol that REQUIRES that the SEC must be represented in the CFP 4-Team Playoff. The world wont stop if the SEC DOES NOT make the 4-Team Playoff. What happens if Central Florida ends the season at (11-0) and is the only remaining 0-loss program left standing? Does the committee tell Central Florida, Congratulations you have won the bridesmaid prize and cant compete for the $50 Million dollars on the table, the opportunity to compete for the national championship or the four team playoff? These are just some of the tough questions the committee probably has not even thought of, but I have. Key: A-Rank Order; B- Team and Current Overall Record; C- Percentage Rate of ranked teams Opponents Cumulative Record from their Non-Conference Schedule and Rank within that Categorical Variable; D- Percentage Rate of ranked teams Opponents Cumulative Record from their Regular Season Schedule and Rank within that Categorical Variable; E- Percentage Rate of the ranked teams Opponents Cumulative Record from their Conference Schedule and Rank; F- Percentage Rate of ranked teams Offensive Efficiency and Rank within that Categorical Variable; and G- Defensive Data Rating based upon that ranked teams ability to string together three Consecutive(3) Successful Defensive Possession Stops(such as a Turnover, aPunt, a Turnover on Downs, a Defensive Intercpetion, a Fumble Recovery and or a Defensive Score) within scheduled games. (Three Consecutive Defensive Stops equals 1 Point). These rankings are based upon research and possessing no bias to how each college football team has been ranked. With 8+ weeks to go within the college football season, I wonder how it will play out. Many surprizes still in store for this college football season. Stay tuned and watch to see what upsets occur as the season concluded.